Baby On the Move Set is a perfect combo of baby bag and mommy's purse. It's large pockets fit everything you need, and when the baby outgrows the bag, just use it as a sports bag or a holiday bag. 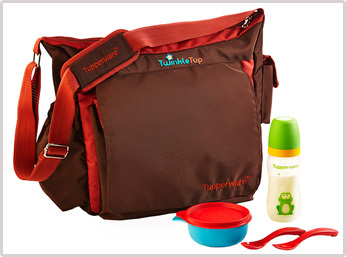 This set consists of TwinkleTup Baby Bag, Baby Bottle, Easy Grip Feeding Bowl and KIDS Cutlery.